mace (if used) and vanilla together in the bowl of an electric stand mixer. 2) Blend together the ingredients using the beaters or the paddle beater. 3) Add the room temperature butter cut into one tablespoon pieces. not mind the extra dish washing). bowl of the food processor. to begin to form clumps. 1) Preheat the oven to 350 deg. 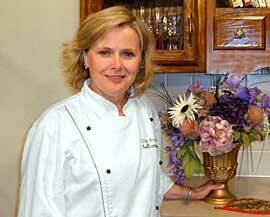 f.
2) Generously brush a rectangular 13 by 9 by 2-inch deep cake pan with butter. nutmeg and mace (if used) and set it aside. brown sugar and citrus zest. 5) Blend the mixture on medium speed until light and fluffy, about 2 minutes. 6) Add the eggs, one at a time, mixing until incorporated. 7) Mix the vanilla extract with the milk. the milk in 2 parts until just combined. 9) Blend on the lowest speed of the mixer after each addition. 12) Using a rubber spatula, gently fold in th blueberries. 11) Spread the batter into the prepared cake pan. 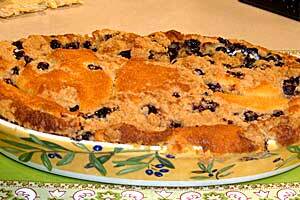 12) Remove the streusel topping from the refrigerator. 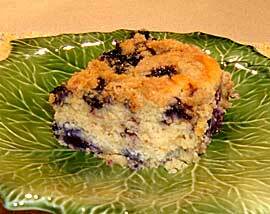 13) Scatter the topping blueberries over the top of the coffee cake batter. 14) Evenly sprinkle the chilled streusel over the top of the blueberries. of the cake registers 190 deg. f. on an instant-read thermometer. 16) Cool on a rack for 15 to 20 minutes before serving. 1) Gently rinse the strawberries and lay out on a cloth towel. 3) Allow to set until later. grater in the freezer for at least 30 minutes or until needed later. shortening is the size of lima beans. Set aside. 4) Remove the butter, plate or bowl and box grater from the freezer. to not scrape your finger tips on the grater. 7) Add ¾ cup of the refrigerator cold milk, stirring it in with a fork. make a dough that holds together. shape that is approximately 6 by 10 inches. 2) Place the oven rack on the lower middle shelf of the oven. 4) Place the casserole in the oven to melt the butter. 5) It is OK if the butter begins to brown but watch it ... do not let it burn. 8) Remove the mixture from the heat. 9) Stir in the lemon juice, vanilla extract and the liqueur (if desired). to be halved.) Set aside in a mixing bowl. 34 inches wide and 10 to 12 inches deep. pastry and roll the pastry, jelly-roll style, forming a long, 34-inch roll/log. 5) Cut the roll into 16 pieces. (First cut the roll in half. Then cut each half in half. 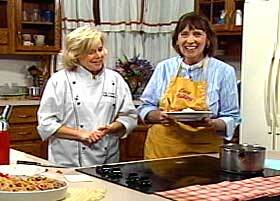 6) Remove the casserole with the melted butter from the oven. them evenly around the bottom. 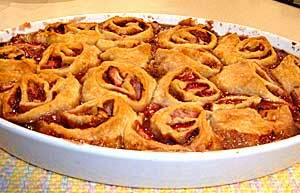 cinnamon-roll-style, over the strawberry layer. not low enough, do not add all of the syrup in the beginning. and some can be added later, if desired. registers 190 deg. f. in the center on an instant-read thermometer. 13) Cool on a rack for 15 to 20 minutes before serving. 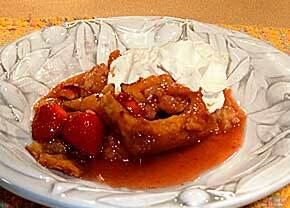 14) Serve with sweetened whipped cream or vanilla ice cream.